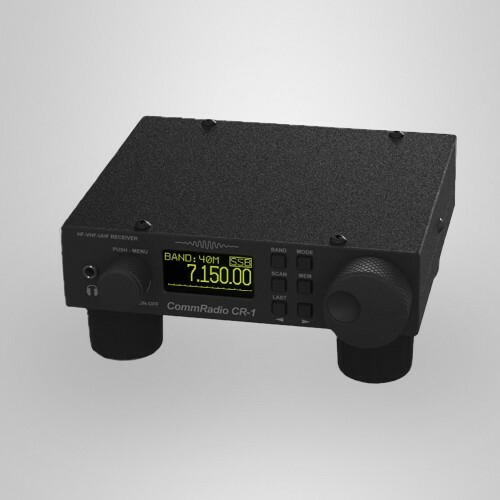 You can now purchase the CommRadio CR1 (we recently mentioned) for $500 plus $12 shipping on CommRadio’s website. As the lead designer of the CR-1, I am pleased to offer this new radio to you. It draws on my experience as a kid building Knight Kits, from my paper route earnings through currently owning a classic Drake 2B and a Zenith Transoceanic; my benchmarks for enjoyable, high quality short wave listening. I added a smooth machined aluminum tuning knob and minimized the number of buttons to provide you (and me), an intuitively obvious and enjoyable radio to operate. This radio is solid as a brick, looks cool and sounds great. The tall feet have a purpose besides good-looks: rest your hand on the tabletop to spin the knob and for the bottom- speaker to bounce the sound to you instead of going straight up into up in space. The military ‘black box’ people who visit us see it sitting on the shelf with the bright OLED display and they all say: “I want one!” Well, here it is. Let the CR-1 draw you into the wonderful hobby I’ve enjoyed throughout my life. I do love the look of this little radio–its simplicity reminds me of the Palstar line of shortwave radios. This entry was posted in New Products, News, Shortwave Radio, Software Defined Radio and tagged CommRadio, CommRadio CR-1, CommRadio Order Page, CR-1, CR-1 Price on February 2, 2013 by Thomas. I would buy a receiver without knowing its core RF performance specifications. It’s odd these figures aren’t specified while the RX is already for sale. I attempted to contact Mr Moore as to questions concerning his CR-1. He replied that he could not get back to me, because of working on updating website for radio sale. OK with that, but never the less, Mr Moore needs to put out more information. I see that he has deleted now one of the mode parameters(FM Broadcast Band) in the radio’s coverage. He still does not provide accepted radio specs like sensitivity and selectivity for one. The CR-1 demo display shows ‘menu’ and ‘mem- button’…but he makes no mention of either of these items in the information listing(i.e. what are in the menu parameters, how many memories, and whether there are banks and programing restrictions. What would be better, is to be able to read the operating manual if he could make that available. The other two points worth mentioning, now that he’s offering the radio for sale: is whether or not there is a return policy, and is a power pack included with the radio?